It’s been too long since we celebrated the garden and the gardeners! 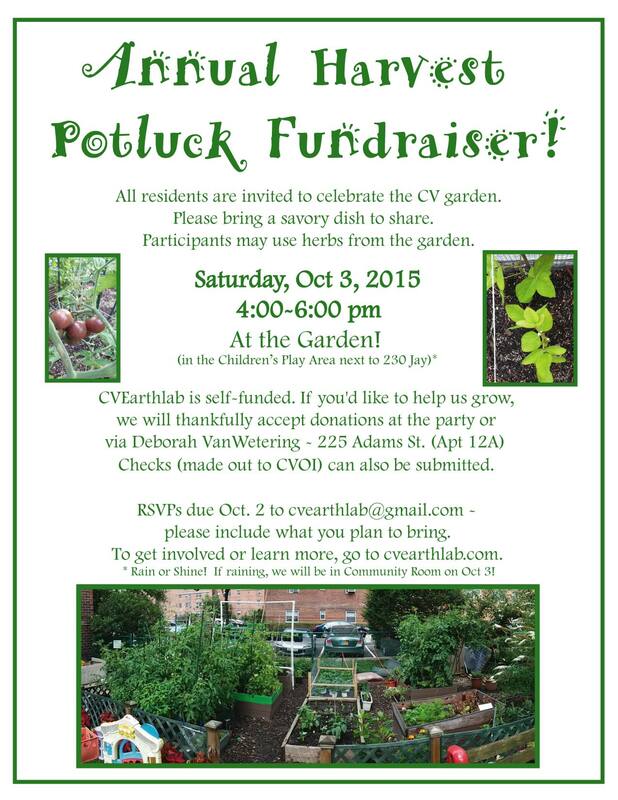 Join your neighbors for a potluck party and fundraiser on Saturday October 3rd from 4pm-6pm (either in the garden or the community room if raining!). We will celebrate the harvest and the end of a successful season with garden-inspired dishes and start to fuel the next season. Guests are invited to bring a savory dish to share and a suggested donation of $10. per person. CVEarthlab members: Please bring annual dues along with a dish. A community garden needs everyone’s commitment to keep it going strong! Most of the garden costs relate to replenishing and maintaining safe soil. Learn more about where the money goes, as well as other donations and help needed on a regular basis, here. Get recipes and see photos from previous parties here. Please RSVP by sending a note to cvearthlab@gmail.com. Thank you. David and I will be there at the pot luck dinner. Great! What do you plan to bring?